The L’Andana Tenuta La Badiola is situated in a particularly auspicious parcel of land near western Tuscany’s Tyrrhenian coast, in the heart of the Maremma at the foot of green hills covered with olive orchards and vineyards. The Tenuta La Badiola, former hunting estate of Leopold II, Duke of Tuscany, has become a refined hotel, an ideal location between Florence, Rome and Siena; located only 7 km from the sea side and 18 Km from Grosseto. The closest airports are: Pisa at 145 Km, Florence at 163 Km and Rome Fiumicino at 184 Km. Going through a large iron gate, walking along a road of pines and cypresses you will arrive at the “Tenuta La Badiola” which extends for 500 hectares of which 30 of vineyards and 50 of olive orchards. The “Tenuta” is composed by the villa, a picturesque and consecrated church and an ancient farm, an entire “borgo” among the scents and perfumes of the Tuscan countryside. L’Andana is a refined and yet reassuring place to make feel you at home with its large and elegant rooms full of modern comforts. The Hotel L’Andana has different room categories, all refined and spacious. The Italian designer and director of AD Magazine Ettore Mocchetti has personally studied the style of the furniture of all the rooms which have been tastefully decorated with antiques and Italian fabrics. They offer visitors the ultimate in refinement and comfort, as well as a magnificent view of the Tuscan countryside and the sea in the background; simple though refined luxury, respecting the spirit of the place. Tradition and modernity are united since the estate is also equipped with ultra modern technological equipment LCD screen television, high speed internet access, DVD-CD player. Superior Rooms – double spacious rooms furnished with taste offer spectacular views of the estate and surrounding area. 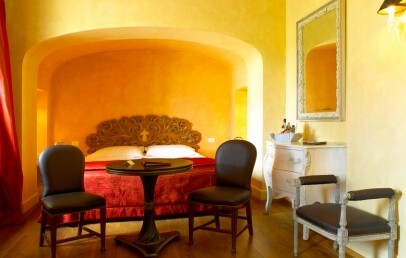 Deluxe Rooms – these rooms have a size of approximately 40-45 sqm, they are elegantly furnished with antiques and nice Italian fabrics, connected to a spacious bathroom they enjoy a nice view on the Tuscan countryside. 5 Rooms of this category have a mezanine. Junior Suite – these rooms of about 50-60 sqm, are composed by a bedroom, a dressing room and a large bathroom with tub and separated shower. The characteristic of this room category is the fireplace and a nice relaxing view on the hills with olive orchards ad vineyards. Superior Suite – The Superior Suites offers a large space that goes from 65 to 70 sqm. Elegantly decorated with Italian fabrics feature a classic style with columns and archs that connect the different rooms; they are composed of a large master bedroom with oversized bed and a master bathroom, a living area with a nice stoned fireplace and a second bathroom. 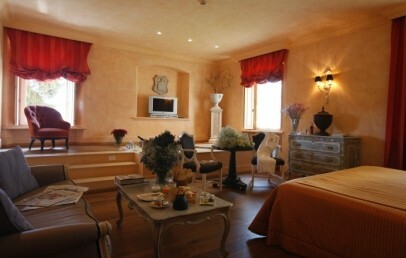 Like the other rooms the suites have a stunning view on the garden, the chapel and the vineyards. This relaxing atmosphere helps the guests to find equilibrium and tranquillity. 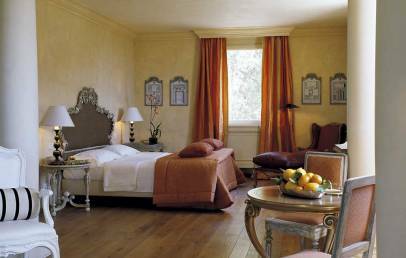 Prestige Suite – around 80 sqm, this Suite is characterized by the Tuscan style with pieces of furniture and fabrics from Florence. Some of these rooms and apartments can be connected. If it was not enough to lie down around one of the three swimming pools (2 outside and 1 inside heated) of the L’Andana in the calm of the gardens and olive trees in front of the Tuscany hills to relax and find a good deal of energy, the wellness centre ESPA is there to help you out. The hotel spa features four rooms dedicated to revitalizing treatments for body and face, including two thermal rooms. One of the best places of the wellness centre is the "Vitality Pool", a unique blend of mineral salts at a temperature of 37 degrees for a soothing and relaxing effect. The spa also includes a fitness area, sauna, Turkish bath and internal pool. The 1 star Michelin restaurant La Trattoria Enrico Bartolini (young, dynamic, many starred chef) offers for only the dinner with traditional Tuscan cuisine: authentic plats, based on genuine ingredients, like the olive oil and the wine of the property. The wine list includes the best nectars in the Italian wine palette. The restaurant is open from May to September and closed every Monday. For lunch the trattoria La Villa is open all day and also on Monday for dinner. Library and reading room, free international newspapers at the reception, private transfers (on request) and to spend the time at Hotel L’Andana the guests can choose among several activities as: internal heated hydromassage pool in the spa (4x5m), gym, golf – putting green, play tennis, play boccia, bike tour, shopping at the Boutique, take cooking lessons and/or wine tasting (on request). Superior double room with double bed, a spacious accommodation, furnished with taste and elegance. The private bathroom is decorated with wooden and marble details in pastel shades. The view depends on the exposure and is either on the vineyards or on the olive groves. 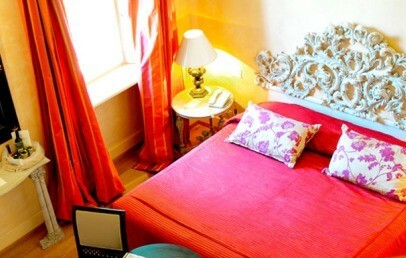 Deluxe double room with double bed, furnished with fine fabrics, antique furniture and simple elegance. A spacious bathroom with all amenities and both rooms have views on the surrounding countryside. Some rooms have a mezzanine, ideal for a small living corner or a room dedicated to children. Double room Junior Suite with double bed, with an inviting entrance, a living area with a stone fireplace for romantic moments. The spacious bathroom offers several amenities and they have a lovely view on the surrounding hills. A spacious Suite Superior with a double bed and a cosy living area with a stone fireplace to enhance a feeling of deep relaxation. The Superior Suite has a beautiful view on the surrounding countryside and the small church. The atmosphere is elegantly decorated and equipped with every comfort and features a commodious walk-in closet. The unique Suite Prestige has a double bed and a ample living area with a stone fireplace to enhance a feeling of deep relaxation and cosiness. The beautiful view on the surrounding countryside and the small church is memorable and the atmosphere is elegant and equipped with every comfort.